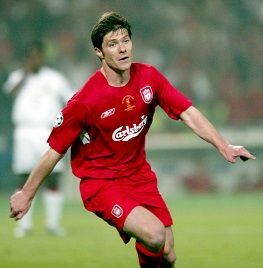 Midfielder Xabi Alonso was a true Kop favourite with a reputation as one of the best passers in the game. The Spain international was among the first players to join the Rafalution with a £10.5million move from Real Sociedad in August 2004. Five years later - after scoring one of the most important goals in LFC history - he departed in a big-money move to Real Madrid. Alonso is the son of former Barcelona star Miguel Angel 'Periko' and brother of Tenerife midfielder Mikel. Both boys came through the ranks at Sociedad, with Xabi making his senior breakthrough in a Copa del Rey match versus Logrones in December 1999. From there, he was loaned to Spanish minnows SD Eibar, only to be called back when Anfield legend John Toshack took the reins at Estadio Anoeta. Alonso swiftly developed into a defensive midfielder with an eye for a pass few of his contemporaries could spot. His arrival at Anfield followed hot on the heels of the appointment of Rafa Benitez, who viewed his countryman as the man to set the tempo in a new-look Liverpool. Alonso made his debut at Bolton's Reebok Stadium on August 29, 2004. Two months later he put in a dazzling performance against Fulham at Craven Cottage which had Kopites purring. With the Reds 2-0 down at half-time, Benitez threw on his new boy. The midfielder duly inspired a miraculous comeback, with the game ending 2-4. His first season in English football was interrupted by a broken ankle following a tackle from Chelsea's Frank Lampard on New Year's Day. After three months out, he returned in the Champions League quarter-final second leg against Juventus. Alonso played 90 minutes as the Reds held the Italians to a goalless draw and thus progressed to the semis. Next up were Chelsea, though a wrongly-awarded yellow card following a brush with Eidur Gudjohnsen meant the midfield anchorman missed the second leg. Never mind, his teammates got the job done, and Alonso would play a pivotal role in Istanbul when the club won its fifth European Cup. It was he who scored Liverpool's third and equalising goal on 59 minutes, knocking in the rebound from his own missed penalty. The Spaniard's second season in England was perhaps most notable for his performance against Luton Town in the third round of the FA Cup. With the Reds 3-1 down early in the second half, he scored two corkers, including a 65-yard punt from inside his own half. Reports afterwards revealed the strike won one lucky fan £25,000. Spookily, the gent had placed £200 on the Reds number 14 scoring from his own half during the 2005-06 season. Liverpool went on to win the FA Cup in Cardiff four months later, with Alonso playing 66 minutes of the final against West Ham. From there, the popular Spaniard was selected for the 2006 World Cup in Germany, where he scored his first international goal in a group match against Ukraine. Alonso returned to Melwood following a second-round defeat to France to prepare for what would turn out to be another memorable season. Not only did he play in his second European Cup final, he also scored another goal from inside his own half in a match against Newcastle United. Remarkably, it was his first Liverpool strike since the almost identical effort against Luton, and he remains the only modern player to score consecutive club goals from beyond the half-way line. In June 2007 Alonso penned a new five-year deal, though sadly much of the following campaign was spent on the sidelines with a metatarsal injury. Fortunately for Spain, he was back in time for Euro 2008 - and the tournament provided another career high as he and his countrymen defeated Germany in the final. Though not always in the starting XI, Alonso featured three times from the bench and wore the captain's armband in the final group game against Greece. With his confidence sky high, our No.14 went on to enjoy perhaps his finest season to date as Liverpool took the 2008-09 Premier League title race to the wire. A personal highlight arrived with a solitary goal which gave us our first win at Stamford Bridge in four years. Sadly for many Kopites, it was to be Alonso's final campaign in a red shirt. That summer, with re-elected Madrid president Florentino Perez assembling his second team of Galácticos, he followed the likes of Kaka and Cristiano Ronaldo to the Bernabeu.